Plasma membrane fraction of mouse embryo NIH3T3 cell line. Our Abpromise guarantee covers the use of ab25245 in the following tested applications. WB Use at an assay dependent concentration. Detects a band of approximately 40 kDa (predicted molecular weight: 45 kDa). ab25245 staining LAMP1 in Mouse epithelial cells by ICC/IF (Immunocytochemistry/immunoflurescence). Cells were fixed with methanol/acetone 1:1 and blocked with 1% milk in PNB for 1 hour at 25°C. Samples were incubated with primary antibody (1/500) in PNB for 16 hours at 4°C. An Alexa Fluor® 568-conjugated Donkey polyclonal to rat IgG, dilution 1/500, was used as secondary antibody. Nuclei were stained blue. 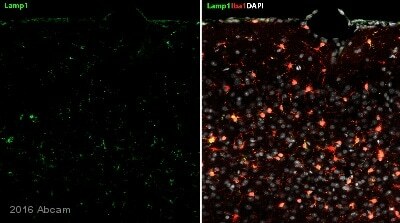 IHC image of LAMP1 staining in human lung formalin fixed paraffin embedded tissue section, performed on a Leica BondTM system using the standard protocol B. The section was pre-treated using heat mediated antigen retrieval with sodium citrate buffer (pH6, epitope retrieval solution 1) for 20 mins. The section was then incubated with ab25245, 10µg/ml, for 15 mins at room temperature. 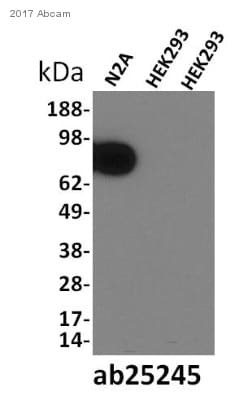 A goat anti-rat biotinylated secondary antibody was used to detect the primary, and visualized using an HRP conjugated ABC system. DAB was used as the chromogen. The section was then counterstained with haematoxylin and mounted with DPX. Overlay histogram showing Jurkat cells stained with ab25245 (red line). The cells were fixed with 4% paraformaldehyde (10 min) and then permeabilized with 0.1% PBS-Tween for 20 min. The cells were then incubated in 1x PBS / 10% normal goat serum / 0.3M glycine to block non-specific protein-protein interactions followed by the antibody (ab25245, 1µg/1x106 cells) for 30 min at 22°C. The secondary antibody used was DyLight® 488 goat anti-rat IgG (H+L) (ab98386) at 1/500 dilution for 30 min at 22°C. Isotype control antibody (black line) was rat IgG2a [aRTK2758] (ab18450, 2µg/1x106 cells) used under the same conditions. Acquisition of >5,000 events was performed. This antibody gave a positive signal in Jurkat cells fixed with methanol (5 min)/permeabilized in 0.1% PBS-Tween used under the same conditions. ab25245 staining mouse macrophage, hepatoma cell by ICC/IF. Cells were PFA fixed and permeabilized in Triton X-100 prior to blocking in 1% BSA for 30 minutes at 25°C. The primary antibody was diluted 1/1000 and incubated with the sample for 16 hours at 4°C. 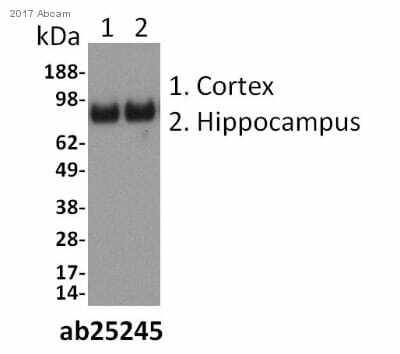 An Alexa Fluor® 594 conjugated goat anti-mouse antibody was used as the secondary. Publishing research using ab25245? Please let us know so that we can cite the reference in this datasheet. What is the predicted MW for human and mouse LAMP1 protein? The predicted calculated MW for LAMP1 is approximately 44.8 kDa (human) and 43.8 kDa (mouse). However, the observed MW for LAMP1 as run on an SDS-PAGE gel can be much higher, and the protein is heavily glycosylated in both species. As such, the predicted observed MW for LAMP1 in both human and mouse is anticipated to be approximately in the range of 110-140 kDa. 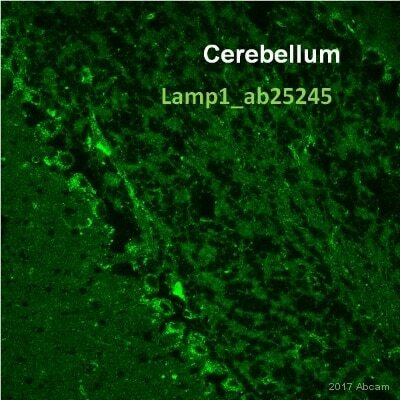 Does product Anti-LAMP1 antibody [1D4B] (ab25245) recognize an intracellular or extracellular epitope of LAMP1? Unfortunately, we have not performed epitope mapping on product Anti-LAMP1 antibody [1D4B] (ab25245). 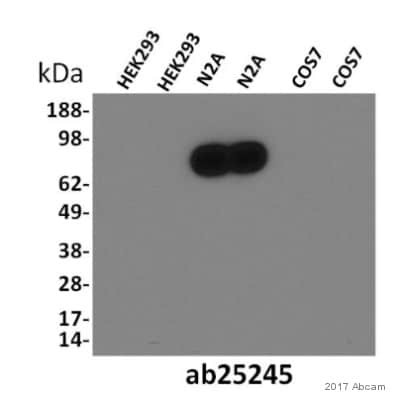 However, QC testing has demonstrated that ab25245 recognizes an extracellular epitope on mouse epithelial cells and macrophages.